Question: Is it halachically acceptable to celebrate Pesach away from home after selling one’s home with all of its chametz contents to a non-Jew? Discussion: Anyone who owns chametz is obligated to get rid of it before Pesach begins. This can be accomplished in one of two ways: By destroying it1 or by selling it [or giving it away] to a non-Jew. 2 Either way, one fulfills his basic obligation and does not transgress the Biblical injunction against owning any chametz. But there is something else to consider: The Rabbis obligated each person to search for chametz on the night before Pesach. [If one leaves town before that time, he is still obligated to search for chametz the night before he leaves, although no blessing is recited for that search.] In the opinion of many poskim, the search for chametz is obligatory whether or not one owns his chametz by the time Pesach arrives, since once the rabbinic ordinance was enacted, it cannot be abrogated regardless of the circumstances. 3 Consequently, selling the house to a non-Jew does not free one from his personal obligation to search for chametz. A solution4 to this problem is to set aside one room in the house, even a small one, and not sell it to the non-Jew along with the rest of the house. That room should be cleaned for Pesach and thoroughly searched for chametz on the night before Pesach, with the proper blessing recited for the bedikah5. One who will have already gone out of town by the night before Pesach should follow the same procedure on the night before he leaves—but he may not recite a blessing on the bedikah. Question: How extensive does the search for chametz have to be? How is it possible to thoroughly search a whole house in a short period of time? Discussion: Halachically speaking, an extensive and thorough search is required in any place where chametz may have been brought during the past year. 6 Since it is almost impossible to properly check an entire house in a short period of time, some people actually spend many hours checking and searching their houses on the night of bedikas chametz, often devoting a good part of the night to the bedikah. 7 But most people cannot—or do not—spend so much time searching their homes for chametz. How, then, do they fulfill this obligation? Certain forms of personal grooming and certain households chores that are halachically classified as “work” are forbidden to be done on erev Pesach after chatzos. Thus it is forbidden to get a haircut or a shave, 13 to sew new clothing14 or to do laundry15 on erev Pesach after chatzos. One must arrange his schedule so that these tasks are completed before midday. L’chatchilah, one should even cut his nails before chatzos. 16 If, b’diavad, one could not or did not take care of these matters before midday, some of them may still be done while others may not: sewing or completing the sewing of new clothes may not be done at all; a haircut and shave may be taken only at a non-Jewish barber; laundry may be done only by a non-Jewish maid or dry cleaner. 17 Other chores, such as ironing clothes, 18 polishing shoes, cutting nails, sewing buttons and other minor mending, 19 may be done with no restrictions. Question: What should be done if a package containing chametz arrives at one’s home or business during Pesach? Discussion: One who knows or suspects that the package may contain actual chametz may not assume ownership of the package. If he can refuse to accept the package, he should do so. If he cannot, he should not bring it into his house or yard and should have specific halachic intent not to “acquire” the chametz. The package is considered “ownerless”—anyone who wants it is free to take it. If the package was mistakenly brought into the home or business, one must have specific intent not to “acquire” it. One may not touch the actual chametz. 20 If the package comes on Chol ha-Moed, the chametz should be immediately discarded, either by burning it or by flushing it down the toilet. If it comes on Shabbos or Yom Tov, it should be put aside21 and covered until it can be discarded. 1. By eating it, burning it, flushing it down the toilet, or throwing it in a river. 2. This is a complex halachic procedure which can only be administered by an experienced rabbi. 3. See O.C. 436:3 and Mishnah Berurah 27 and 32. 4. Another possible solution [for people who are away for Pesach and are staying at another person’s home] is for the guest to “rent” from his host—with a valid kinyan—the room in which he is staying, and search for chametz in that room; Maharsham 3:291. But other poskim prefer not to rely on this solution; see Shevet ha-Levi 4:44. 5. Siddur Pesach K’hilchaso 12:1. 7. Several gedolim, among them the Gaon of Vilna, the Chasam Sofer and the Brisker Rav, were reported to have spent a good part of the night searching their homes for chametz. 8. Sha’arei Teshuvah 433:2; Da’as Torah 433:2; Chochmas Shelomo 433:11; Rav S.Z. Auerbach (quoted in Mevakshei Torah Ohr Efrayim, pg. 532); Kinyan Torah 2:122; The basic idea is quoted by Sha’ar ha-Tziyun 432:12. 9. Siddur Pesach K’hilchaso 13:1. 10. See Pnei Yehoshua (Pesachim 50a) for a third reason for this prohibition. 12. Beiur Halachah 468:1. According to this reason, even when erev Pesach falls on Shabbos it is forbidden to do work on Friday. 16. Mishnah Berurah 468:5. Although a minority view recommends that one shower/bathe and polish his shoes before chatzos as well, this was not accepted by most poskim. 17. Mishnah Berurah 468:7. Towels and children’s clothing which became dirty (or were discovered to be dirty) after chatzos and are going to be needed during Yom Tov may be machine-washed even by a Jew. 18. Orchos Rabbeinu, vol. 2, pg. 56, quoting an oral ruling by the Chazon Ish. 19. Rama, O.C. 468:2 and Mishnah Berurah 8. Lengthening and shortening a hem is also permitted. 21. 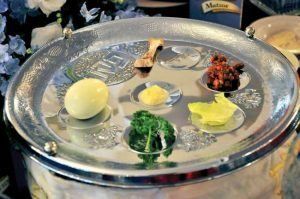 The chametz is severe muktzeh and may not be moved for any reason; O.C. 446:1. Some poskim add that it may not even be moved with one’s body or foot, even though other types of severe muktzeh may be; L’horos Nassan 5:30.